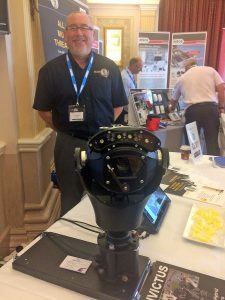 360 Vision Technology technical partner Ogier Electronics, report strong support for the newly launched Invictus cost-effective, high-performance, ruggedised all-in-one PTZ camera, during their demonstration at SecurityTWENTY 18 Conference and Exhibition (ST18 North), Harrogate. At the close of last week’s ST18 North, Ogier’s Sales and Marketing Director, Mark Rainbow, reported consistently positive feedback to Invictus from visiting delegates. “Along with very attractive pricing for its high-level of performance and rugged build quality, delegates were clearly impressed with the Ogier Radar/Invictus camera combination for applications such as wide-area and perimeter fence line intruder/activity detection,” says Mark. “We already have the camera combination installed at Tilbury Docks, where the Radar/Invictus combo is monitored by Netwatch Open Site Surveillance 24/7, ensuring highly-effective security for Hyundai new vehicle storage.